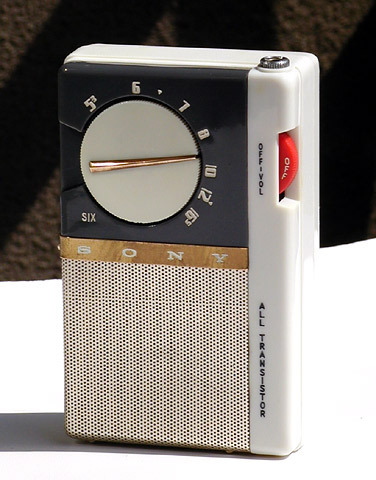 So, what we have here is Sony's second shirt-pocket transistor radio*. The clean, functional design, quality build, and reassuring heft in the hand clearly distinguish the model as one of the all-time great sets of its era. The list price of ¥8,800 represented a full ¥5,000, or 36%, reduction over the ¥13,800 price tag on the TR-63. In the few ads in which the TR-65 appeared, Sony featured this great new price, along with ease of use and the improved performance of new 2T7 series transistors inside. Sadly though, the company seems to have opted not to export the model, likely because the TR-610 was being prepared to enter the U.S. market for the 1958 Christmas season. In the end, production numbers for the TR-65 were extremely low. One sad piece of history leads many collectors to unwittingly misinterpret or underestimate the charm of the TR-65. That is, many have only heard of the model when compared to the cheap clone that later appeared in large numbers. A story in a period Sony newsletter for employees refers specifically to the "Orion OTR-6A" as the culprit, and goes on to relate the tale of how a furious Sony sued for design rights infringement, won the case and received reparations a few years later. This story may reveal one more reason why Sony stopped marketing the TR-65 so quickly. To a maker highly concerned about brand identity, it would surely be preferable to drop the model and distance themselves from the cheap look-alike as fast as they could. Besides, by the time these events transpired the TR-610 and TR-86 were on the market and Sony was coming out with other new models at a rapid pace. Now, anybody who has had the pleasure of seeing both the Sony TR-65 and the Orion in person knows that there is no comparison in terms of overall quality and flair. Willfully paraphrasing my own words from a letter to a good friend and fellow collector a while back, "To hold the two radios in the hand is a completely different experience. Where the Orion looks and feels kinda light and cheap, the TR-65 weighs heavy and the quality exuded by its cabinet and fittings leaps forth immediately. On an overall WOW scale up to 10, I'd give the Orion a 1.0 and the TR-65 a 9.5." It's like comparing a genuine Ferrari 250 SWB to an old VW Beetle chassis onto which some high school student has slapped a curvy fiberglass aftermarket body! *This excludes the TR-2K and TR-33, two earphone-only models released in October 1955. *Note (08.08.15): I updated the reference to the clone to reflect specific documentation I found more years ago than I'd like to admit to myself. I've been meaning to update this for the longest time. Sigh.